The Rhinoceros, often called ‘rhino’ for short is one of five surviving species of odd-toed ungulates in the family Rhinocerotidae. The word ‘rhinoceros’ means ‘nose-horn’. This relates to the long horn or two long horns in the case of the White Rhinoceros and the Black Rhinoceros, which is perched on top of their noses. Two species of rhinoceros are native to Africa and three to southern Asia. Three of the five species, the Javan Rhinoceros, Sumatran Rhinoceros and Black Rhinoceros are critically endangered. The Indian Rhinoceros is endangered, with fewer that 2500 individuals remaining in the wild. The White Rhinoceros is classed as Vulnerable, with roughly 14,500 remaining in the wild. 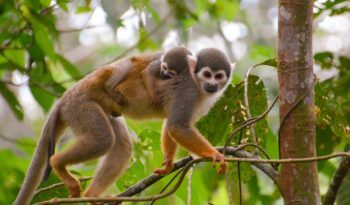 The word ‘perissodactyl’ comes from the Greek language and means ‘odd-number finger or toe’. Perissodactyl are herbivores which means they do not eat meat, they only eat vegetation, plants and grasses. Rhinoceroses are large, thick skinned animals that can grow to be between 3 and a half feet to 6 and half feet tall at the shoulder and they can weigh between 1 – 2 tons. 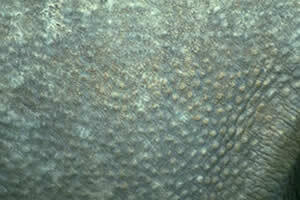 A rhinos skin is around 1.5 – 5 centimetres thick and is formed from layers of collagen (the main protein of connective tissue in animals and the most abundant protein in mammals), positioned in a lattice structure (crisscrossed framework). Rhinos have relatively small brains for mammals this size. A rhinos brain only weighs around 400 – 600 grams. The rhino ‘horn’ is not a real horn but thickly matted hair, consisting of Keratin, the same chemical substance that our finger nails and hair are made of. If a rhinos horn is broken off, it will grow back again. A rhinos horn grows all through its lifetime and grows at a rate of 1 – 3 inches per year, the longest recorded rhino horn is 5 feet long. 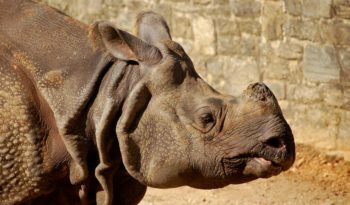 All rhinoceros species have 82 chromosomes (a structure in all living cells that consists of a single molecule of DNA bonded to various proteins and that carries the genes determining heredity), except the Black Rhinoceros, which has 84. 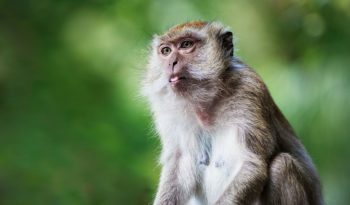 This is the highest known chromosome number of all mammals. Rhinoceroses are herbivores and eat vegetation. 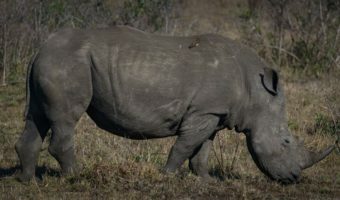 Rhinos generally eat leafy material, although their ability to ferment food in their hindgut allows them to subsist on more fibrous plant matter, if necessary. Although Rhinoceroses are not inclined to approach humans, rhinos may exhibit bursts of aggression, just like hippos. Fortunately for their enemies, they have very poor eyesight which prevents them from making targeted attacks. A rhinos sense of smell and hearing however are well developed. The gestation period of a female rhinoceros is around 16 months. A rhinos life span is between 35 and 40 years. Unfortunately, rhinos are a severely endangered species. Rhinos have been on the brink of extinction numerous times. This is mainly from humans. Humans seems to be the rhinos only predator. 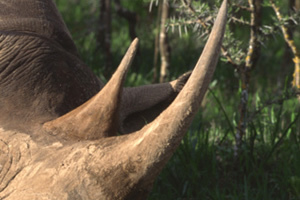 The rhino is poached and hunted mostly for its horn. In Asian countries they use the horns for alternative medicines, ornaments and other really unnecessary things. 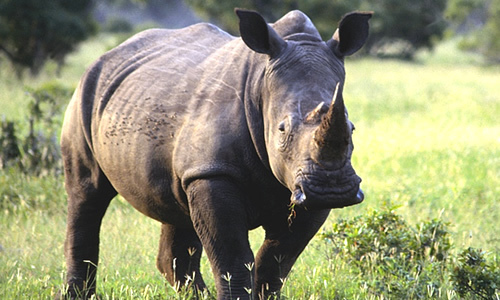 In 1984, the rhino population was so low it was feared they would be wiped out altogether. Thanks to their rescuers who gave the remaining rhinos sanctuary in reserves and safe haven farms, they were allowed to increase their numbers and be re-introduced. 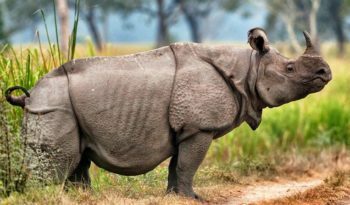 There are 5 different species of rhino, two African species, the White Rhino and the Black Rhino and three Asian species, Indian Rhino, Sumatran Rhino and Javan Rhino. 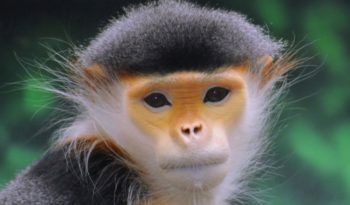 If you click below or on the menu above on the right, you can find out more about each individual species. The Swahili Name for Rhinoceros is 'Faru'. If a rhino accidentally steps into a ditch, it cannot get out because rhinos cannot step! The rhino 'horn' is not a real horn but thickly mated hair, consisting of Keratin; the same chemical substance as our finger nails.